A rollicking read-aloud about a zany chain of events triggered by a broken tree, a cranky Bear, a nut-loving Squirrel and his loyal friend Moose. Kirkus Reviews says: A bonanza of possibilities opens up for Moose, Bear, and Squirrel, three forest companions. There are two outcomes, one unremarkable and the other outlandish, for each of many causes, starting with the first page of the story. “When a tree grows,” it can become either a “scratching post for Moose’s itchy antlers,” or it can crash and fall, waking up Bear, who can do one of two things. And so it continues, as Moose encounters a truck, which leads Squirrel to set off for the city for a “job at Nifty Nuts as a quality control inspector.” Or not, which could lead to either a career as an actor or to his missing Moose and home. Which leads to an awesome “Welcome Home party,” which leads to—and the book concludes with—an even more awesome Edenic forest setting for reading, lounging, and just being one’s animal self. The text and the colorful digital illustrations work together in this silly but entertaining tale. Each verso page is busily filled with action and onomatopoeia while the corresponding recto page highlights one of the characters. The bottom right of this page features an image of a turned-up flap and a large “OR…” providing quick pacing for each far-fetched but why-not outcome. Laugh along as a story about a tree in the forest comes full circle, bringing three creatures along for a bumpy but fun ride. 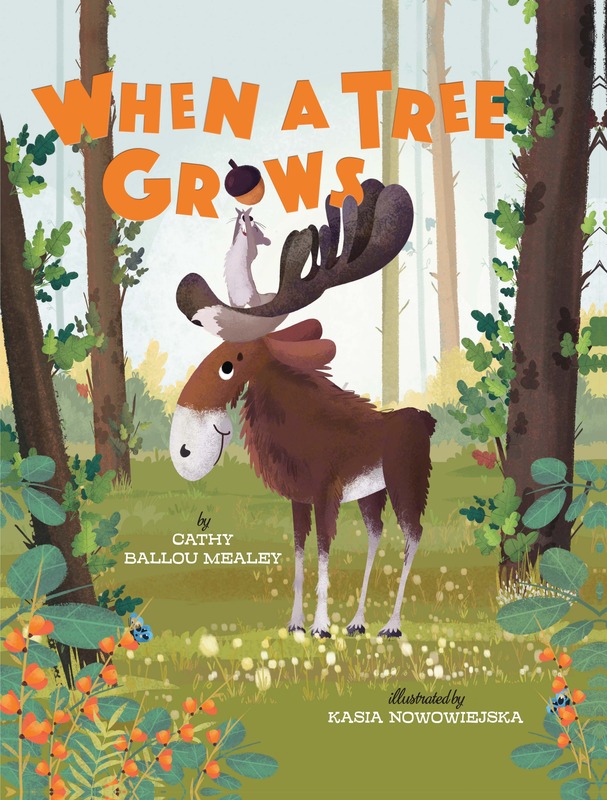 Bulletin of the Center for Children’s Books says: According to this playful picture book, when a tree grows only two things could possibly happen: Moose could use it as a scratching post for its antlers, causing the tree to sway gently from side to side, or Moose can push too hard, forcing the tree to fall over and crash into Bear’s den. Bear could, in turn, ignore the noise and continue his nap, or he could stomp outside; there he could decide the sun is too bright and head back into his cave, or he might stumble into Moose, continuing a series of events that could at any point end with little drama but that are instead given the potential for further silliness. There are obvious parallels to If You Give a Mouse a Cookie, and this book similarly amps up the goofiness as Moose and Bear’s encounter leads to Squirrel’s catching a ride to the big city and becoming a movie star but then missing the forest so much that Moose scooters into town and takes him home, where a welcome party and acorn treats bring story full circle. The layout smoothly guides viewers along, with a trompe-l’oeil lifted page corner bearing the legend “Or …” tempting youngsters to turn the page, and the result of the previous presented possibility taking up the verso as the recto introduces viewers to the next setup; while the digital art can get a bit busy, it also has moments of eye-catching richness. Fans of the antics of the aforementioned mouse (and that series’ moose counterpart) will delight in these forest animals’ increasingly kooky adventures.